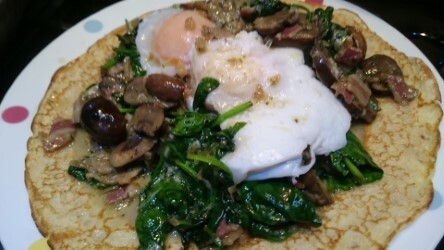 Crêpes with Sautéed Mushrooms, Spinach and Poached Duck Eggs. Delicious Crêpes recipe stuffed with sautéed mushrooms, lardons and spinach, with luscious melted blue cheese, tipped with a poached duck egg. This little number is perfect for a lazy weekend Brunch and can easily be adapted to suit a vegetarian palate.